I am constantly searching for new and valuable content on the internet for my Websites, that's how I found "Catholic Cancer Prayerline ". Having a friend that her Mom suffers of cancer I joined the group at Flikr immediately. Unfortunately after 40 perfectly healthy years, I became sick; some problems with my liver. Immediately I asked mr.e's mom (the group admin) to pray for me too. Well she must have done a very good job, since miraculously I am healthy again. I named this entry fun stuff, happy and Prayers as for the Categories that I am using. "This place was made by God..."
The beautiful Lady Chapel in Westminster Cathedral has the distinction of being the first completely decorated chapel in the cathedral, c.1903. 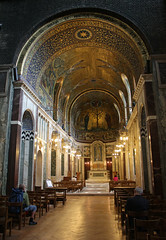 In contrast to the dark brickwork around the chapel, the sense of awe is intensified as one enters the gleaming mosaic-decorated space with its narrative drawn from the life of the Blessed Virgin Mary. Vespers is beautifully sung every evening in this chapel, which adds to the numinous experience of praying in this holy space. Hello I like your post "ff, Happy and Prayers | By Catholics" so well that I like to ask you whether I should translate into German and linking back. I always like reading articles and really enjoyed yours! I admire what you have done here. I like the section where you say you are doing this to disseminate stand behind but I would simulate by all the comments that this is working quest of you as well.